This article tells how to install and configure Squid and Softperfect Bandwidth Manager to enable transparent proxying in a Local Area Network (LAN). Transparent proxying lets you cut usage of your Internet connection and, as the name suggests, this process is invisible to the end users. In order to implement this, you need to have a running server with Windows XP or above, a latest copy of Softperfect Bandwidth Manager and a copy of Squid Cache. Since Squid is distributed in a form of source code, the next chapter will tell you where to get a ready-to-install Windows build and how to install it. The latest stable version of Squid available at the time of publication was 2.7 stable 5. You can download it from the official Squid website. Once you have downloaded Squid, unpack the ZIP file to the c:\squid folder. You may want to choose a different folder for Squid, but bear in mind that this will require you to update paths throughout the Squid configuration file. The following instructions assume that you have unpacked Squid to c:\squid. Open the newly copied c:\squid\etc\squid.conf in Notepad and locate the line http_port 3128. Add the keyword transparent to make Squid understand regular HTTP request, so the line is http_port 3128 transparent. Before you start Squid for the first name, you must initialise its cache. Launch c:\squid\sbin\squid.exe -z to initialise the cache. Install Squid as a Windows service. Launch c:\squid\sbin\squid.exe -i to install it as a service. Attempt to start the service by typing net start squid at a command prompt. If it starts successfully, you have finished initial Squid configuration. If it does not and displays “The process terminated unexpectedly”, there is one more configuration parameter that you need to change. Open c:\squid\etc\squid.conf again and uncomment the unlinkd_program parameter. Then replace regular slashes with backslashes, i.e. change it from c:/squid/libexec/unlinkd.exe to c:\squid\libexec\unlinkd.exe. Now you should be able to start the Squid service cleanly. 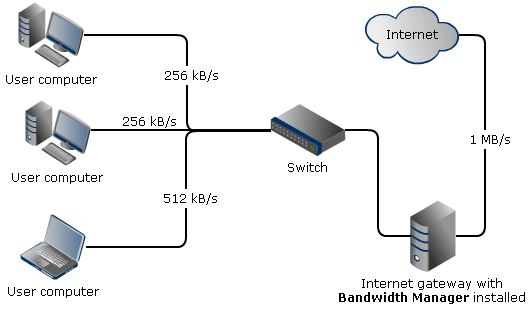 If your setup is similar to this, you can proceed with the Bandwidth Manager configuration. Choose Tools - Port Mapping from the main menu and define a mapping as shown below. Then define a bandwidth management rule. Set the source and destination according to your needs. In this example we redirect all HTTP traffic coming from client computers in the range 192.168.0.1 - 192.168.0.255. It is important to choose the correct network card to apply the rule on. In this example Internal refers to a network card facing the LAN clients. Now all users in the range 192.168.0.1 – 192.168.0.255 accessing web-resources via port 80 will have their requests processed by Squid. Check c:\squid\var\logs\access.log and c:\squid\var\logs\cache.log to make sure everything is working correctly. Whenever you design bandwidth management rules, bear in mind that it only makes sense to redirect HTTP requests to Squid. This is also the reason why we have set destination port to 80 to filter out all other types of traffic. Attempting to route DNS, SMTP, POP3 or any protocol other than HTTP via Squid will fail. More information about Squid including FAQ and configuration guide is available at the official Squid website. Questions and comments are welcome at our on-line forum.